Home Entertainment Event GenSan Happening Information SM City – General Santos 3-Day Sale! 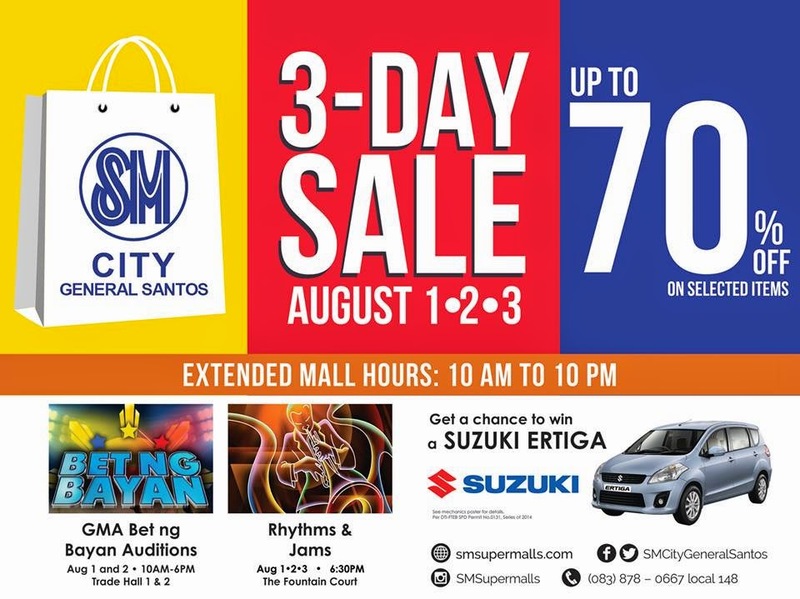 SM City – General Santos 3-Day Sale! As one of the leading malls in General Santos City and the biggest in SoCCSKSarGen, SM City – General Santos once again orchestrates mall rats’ much-awaited 3-Day Sale! Check out the 3-Day sale from August 1-3, 2014 and enjoy huge discounts and great deals up to 70% off on the countless selections mall wide. In line with this, SM City – General Santos staged GMA Bet ng Bayan Auditions on August 1 and 2, 2014 in Trade Hall 1 and 2. A nightly band entertainment will be up starting August 1, 2014 every 6:30pm ‘till August 3, 2014. In addition to that, SMCGS extended its mall hours from 10am-10pm. For SM Prestige cardholders of SM City – General Santos, grab the chance to enjoy the first dibs of the 3-Day Sale starting tomorrow, July 31, 2014. Plus get additional 10% off on selected items at SM Store, Surplus, Ace Hardware, Toy Kingdom, and SM Appliances.